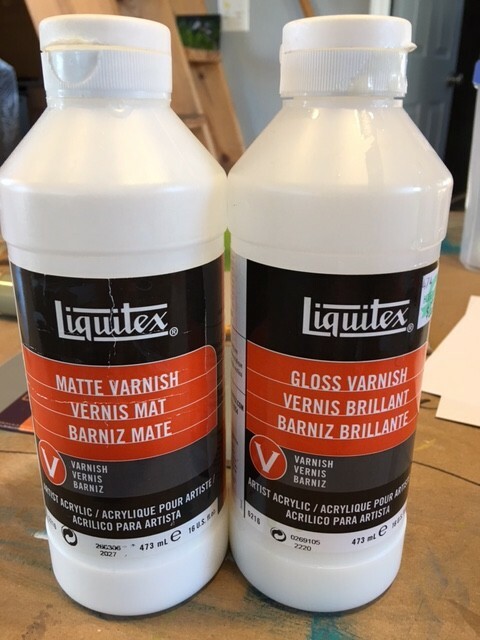 Hi folks, I have tried several different final varnishes so far with mixed results, which is really stressful because your coating a FINISHED painting you have been working on for how long? I have coated paintings and then quickly tried to wipe off a foggy varnish, or it catches and balls up! It makes you crazy! I have found two methods that have worked well and are consistent, the stress is still there, just greatly reduced. I used to mix two Grumbacher varnishes with equal parts water, 1/3 gloss, 1/3 matte and 1/3 water, carefully blending them together to keep bubbles down. This mix was quite thin and dripped readily off of my brush. I really like that this particular mix was somewhat thin, it felt like it was filling every little groove on the surface, while drying quickly. This method would take two applications or coats, ending with a satin finish that I really like. Being who I am I ran out of the Grumbacher and had to quickly varnish a piece I had sold, I couldn’t find the Grumbacher I used so I tried Liquitex Gloss and Matte Varnishes. They come out of the bottle much thinner than my tried and true Grumbacher but I still mixed in a little water trying to maintain my 1/3 of each formula. Well it got cloudy as soon as I applied it, scary! I know some varnishes cloud at first then clear as they dry but this was not clearing up so I wiped it off, it was a mess but salvageable. My mistake was the water and wanting a Satin finish. 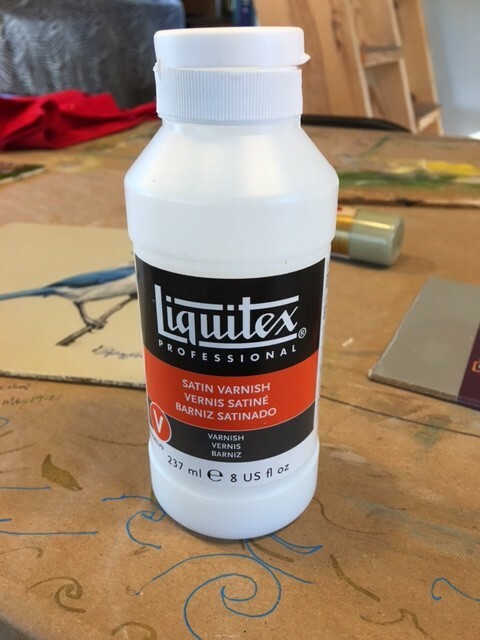 The Liquitex Final Varnish was thin enough and didn’t need the water so I went back looking for a Satin finish, which is what I use now. I pour the varnish out into a glass ramekin or bowl adding no water and I apply it with a fan brush, brushing both horizontally and the vertically, finishing with horizontal from top to bottom. I let the first coat dry for a few hours then do a second coating. 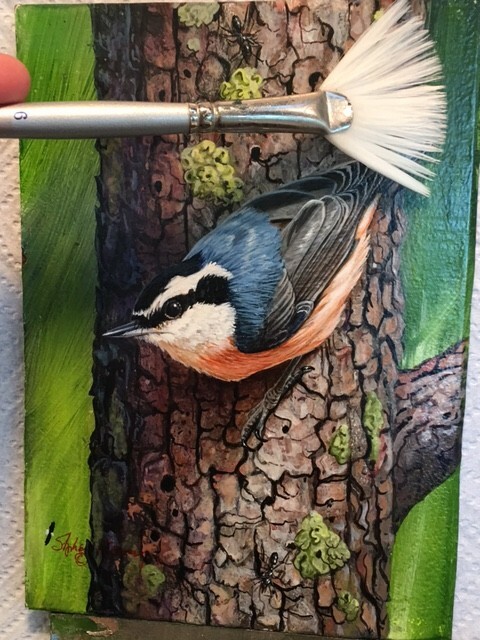 On the finished painting below you can see a little glossiness on the right hand side just in front of the brush. This is the satin Finish I want, it protects and enhances the artwork! Happy Painting!